It must be a slow burger month in January. This past week I received some Wendy's coupons in my mailbox. On top of these, in the previous three weeks I've received Burger King, Harvey's and McDonald's. Seems they are hard up to sell their burgers and fries. The end of the Christmas season has probably lead these big burger boosters to see a traditional decline in sales in January. Not one to argue, I will gladly take the coupons and set out to see what I can find. I needed to visit RONA for some home improvement items after a recent furnace inspection and the technician recommended a few venting options that would make our system run better. 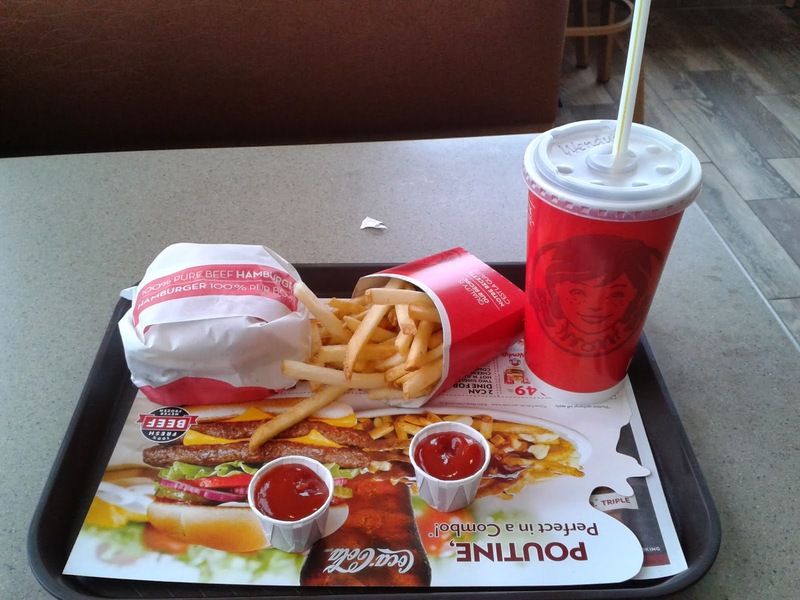 Before visiting RONA, I decided I would investigate the nearby Wendy's (1511 Innes Road, Ottawa) for some lunch. 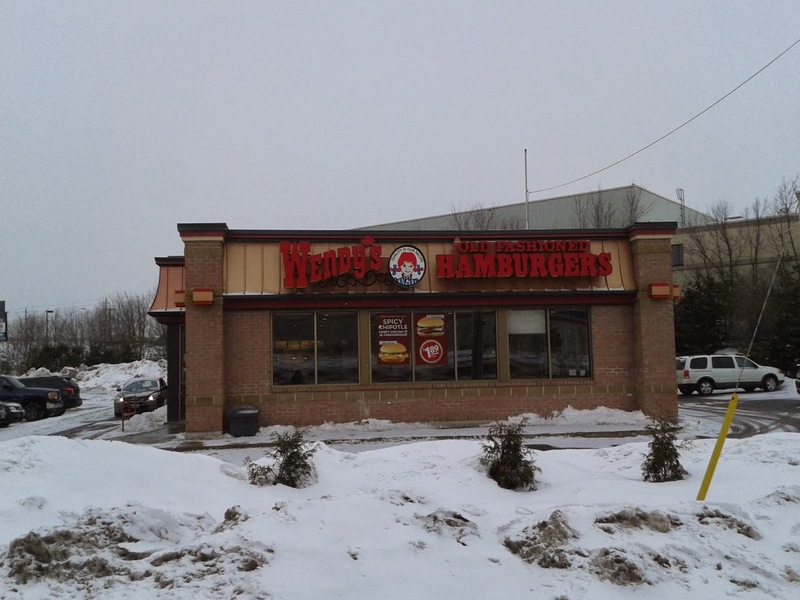 This Wendy's is situated off of Innes but is accessible via the Home Depot and Homesense parking lot from Cyrville Road. I entered via the Innes Road across from the nearby Travelodge. I had been to this Wendy's before and found it to be a mediocre run of the mill Wendy's that corporate would be proud of. The same usual carpeting with tables with decent food and service up to standard. So I wasn't expecting much as I opened the front door after returning more than a month after my previous visit. Upon entering, I was met with by a whole new wood floor themed look. There was even two fancy fake fireplaces gracing a partition in the middle of the seating area. Look like the same tables and chairs as before but carpeting and a few other features were improved. As well a new drink and condiment station had been installed meaning this was my first Wendy's where customers could actually be trusted to pour their own beverage of choice and obtain free refills! I went through the line quickly as there was only one other customer ahead of me, dumped my coupon on the counter and ordered. The Order: 1 Single Cheeseburger Combo with fries and Coke. The cashier first rang in the order at the regular price resulting in a price of $7.89. But before I could say anything realized the mistake and said "let me try this again." She first got the coupon correct ($4.99 before tax with the coupon) and then totalled it correctly with tax for a grand total of $5.64. Next we waited for the food to be ready. It took a little while and the behind the counter organization looked a little disorganized. One lady was working the burger area with a drive thru headset on. She was busy scurrying about making burgers, cooking fries and ensuring the drive thru was taken care of. But what about the front counter where I was standing? The cashier moved onto the next customers as I waited. The kitchen was empty for about 15 seconds before kitchen lady returned, made my burger and left it for pickup. The cashier finished ringing in the next customer's order and retrieved my burger and put it on my tray along with cup for the Coke. She then disappeared out of site in the direction of the fries. But she came back empty handed. She avoided my gaze and looked for the next customer. Just before I was about to say something, the kitchen lady appeared, dropped off my fries and I left for the soft drink machine and the table. I sat down and gazed at my order. Single Cheeseburger Combo including small fries and drink. Memories of going to Wendy's in Aurora during my teens flooded back. Sure the prices were cheaper back then. Now without the coupon, I would have paid $7.89 including tax for this. In my teenage years and not to long ago this combo would have been different. This same combo would be a regular burger without cheese, a medium fries and a medium drink. Both the fries and drink have been cut back in size to today's small sizes. The burger has been changed by adding a piece of cheese. Not sure why Wendy's corporate decided to go with adding cheese when the original option of upgrading a regular burger to add cheese was always an option. Taste wise the burger was delicious slightly moist with decent toppings. It was a regular size and not noticeably shrunk like has been occurring somewhat at other fast food places. The fries sure may been shrunk in quantity in combo size, but were just as I remembered them as a teen. Chewy on the inside and outside but not soggy gross. The Coke was even satisfactory as well for a fountain drink. I only mention this as it was a nice touch of Wendy's to allow free refills. But I guess the move by McDonald's to institute the idea of moving the soft drink machines from behind the counter might of pushed Wendy's into doing this. Overall, this Wendy's has improved over my last visit. The redesign was totally worth while to present a modern dining approach while still maintaining the fast food burger experience. Added plus was the cashier adding another sheet of coupons to each tray in hopes of enticing customers to return in the future. This is the first time I have seen in a while where a fast food place actually puts out coupons at the store to entice people to return. Will I return? Most definitely if the coupons are still valid for my next visit. Otherwise, at $7.89 including taxes for a single cheeseburger, small fries and small drink, probably not.